Overclocking is a way to improve the performance of a hardware unit (generally processor) by running it at higher frequencies than rated. Overclocking is a risky process and it does voids the warranty of the component whether it is a processor or RAM. If done wrong then you may also cause damage to the component and render it useless. Overclocking of CPU or processor is done generally though the motherboard BIOS, where you can either increase the FSB, Multiplier or both in some cases. For extreme overclocking you may have to increase the voltage of the component or processor to make it run at much higher frequencies. Overclocking does increase the temperature of the processor / CPU and you have to buy a good aftermarket cooler to keep the temperature in control. Here in this post I am going to talk about Graphics Card Overclocking. In Graphics Card you can overclock both the GPU (Graphics Processing Unit) and the Memory. The process of overclocking a graphics card is way different from a CPU because to overclock a graphics card you need some special tools. These tools are known as Graphics Card Overclocking softwares or tools. These GPU overclocking tools run in Windows OS and from there you can overclock your graphics card GPU and memory by using the interactive GUI. Here I will provide you the list of best free graphics card overclocking tools to overclock your nvidia or AMD based graphics card. 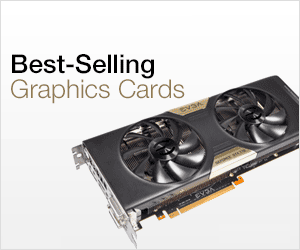 You can also checkout the best graphics card info tools to know the technical details of your graphics card. Here are the best graphics card overclocking softwares that are available for free to download and use. 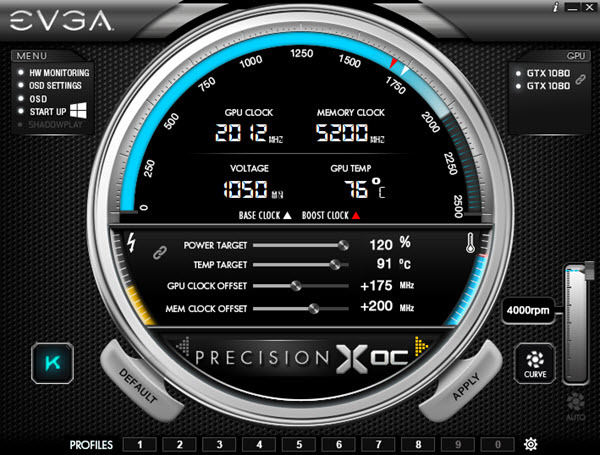 EVGA Precision X is truly one of the best overclocking software for Nvidia GeForce Graphics cards. Using this graphics card overclocking tool you can overclock both your GPU and Memory very easily. It comes with tons of other advanced features such as voltage adjustment, fan control, automatic tuning, performance graphs or curves, profiles, hotkeys and much more. The latest version of EVGA Precision X softwares is the EVGA Precision XOC that supports the latest GeForce 10 series graphics cards from nvidia. I have been using EVGA Precision X for all of my GeForce series cards and never had a problem with any of them. The software is also updated frequently to keep up with the newer nvidia graphics card drivers. EVGA Precision X supports Microsoft Windows 10, 8.1, 8, 7, Vista and you can download it for free from the link given below. 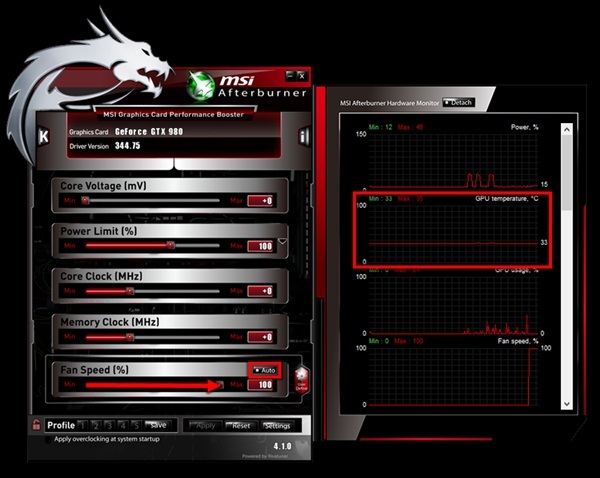 MSI Afterburner is also one of the top graphics card overclocking softwares around. Using this you can control your GPU clock, Memory clock, voltage level and fan speed. It comes with advanced features like in-game fps counter, custom skins, in-built benchmarking tool, hardware monitoring, custom profiles and video capturing. The in-built graphics card benchmarking tool in MSI Afterburner is known as Kombustor. MSI Afterburner supports all the latest DirectX 12 graphics cards and can run on both 32-bit and 64-bit version of Windows operating system. You can download it for free from the link given below. 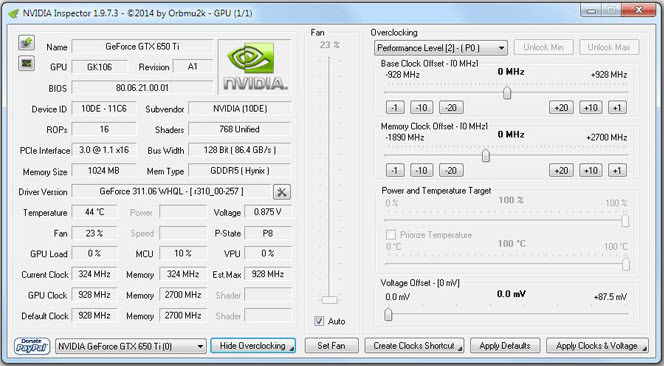 RivaTuner is a very popular overclocking graphics card software. It has been around from a long time and is still updated with the every release of new graphics cards and its drivers. RivaTuner do have limited support for the AMD / ATI Radeon graphics cards but it is mainly built for Nvidia Graphics Cards. Its user interface may not be visually appealing as the EVGA Precison or MSI Afterburner but it is a powerful overclocking software that can be used to overclock GPU Core, Memory and control fan speed. Features include hardware monitoring, custom profiles, registry editor etc. RivaTuner supports almost all Nvidia Graphics cards starting from the Riva TNT family to the latest GeForce graphics cards. It supports both 32-bit and 64-bit version of Windows. 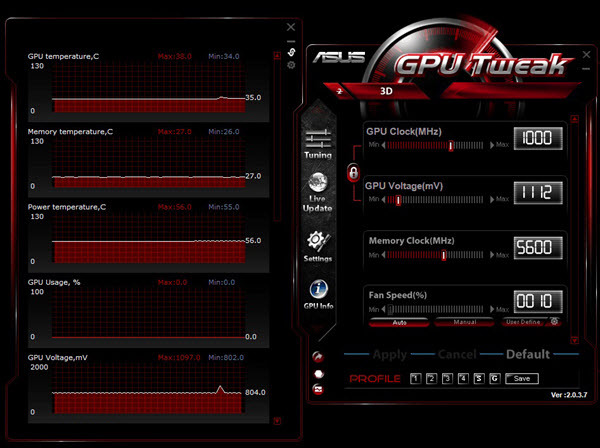 You can download this advanced GPU overclocking tool from Guru3d.com from the link given below. Formerly known as the AMD Catalyst Control Center (CCC) or ATI Catalyst, AMD Radeon Software Crimson is new graphics software and device drivers bundle for AMD Radeon Graphics Cards. 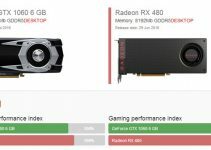 Using AMD Radeon Software Crimson you can easily overclock your AMD Radeon Graphics card GPU and Memory without the need of any third party overclocking software. Using AMD Radeon Software Crimson you can control GPU core clock, Memory clock, Fan speed and more. It is more user friendly, feature rich, stable and powerful than the older AMD Catalyst Control Center. You can download it for free from the AMD official website from the link given below. A great overlocking utility for the AMD Radeon Graphics cards. The User Interface (UI) of this overclocking tool is nice and friendly. Using this OC Tool you can overclock your AMD Radeon graphics card GPU, Memory, adjust the fan speed and more. It includes features such as graphics card info, fan health check, hardware monitoring and voltage control. You can customize the different elements of this software using different colors for your convenience. This feature is called Nitro Glow. You can download this amazing AMD Radeon Graphics Card Overclocking software from the link given below. This is one of the best overclocking utilities for Nvidia and AMD graphics cards. This overclocking software from Gigabyte lets you overclock GPU and Memory, control fan settings & speed, set temperature limit, change card LED settings and change voltage of your graphics card. The user interface of Xtreme Engine Utility is very appealing and is also very easy to use. This overclocking utility from Gigabyte supports GTX 950, GTX 960, GTX 970, GTX 980, GTX 980 Ti, GTX Titan, Radeon RX 460, RX 470, RX 480, GTX 1050, GTX 1060, GTX 1070, GTX 1080 graphics cards. Gigabyte also comes with AORUS Graphics Engine Software for its high-end AORUS graphics cards. 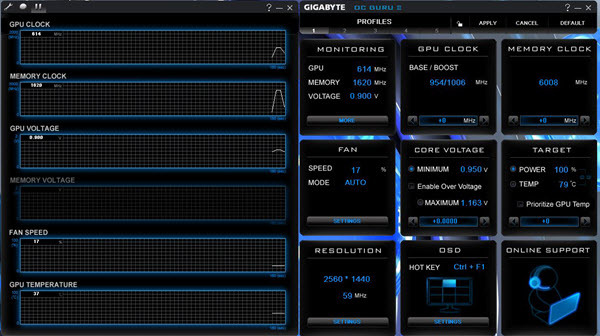 Gigabyte OC Guru II is a decent overclocking utility for graphics cards from Gigabyte. The GUI is all in black and blue color and it is simple to use. The various overclocking features include GPU overclock, Memory overclock, voltage control and fan control. It supports both Nvidia and AMD graphics cards that include NVIDIA Gerforce 200-series, 400-series, 500-series, 600-series, 700-series, 900-series, GTX TITAN and ATI Radeon HD 5000-series, 6000-series, 7000-series, R7 200-series, R7 300 series, R9 200series, R9 300series, R9F/NANO series Models. Note: This utility is only for older graphics cards. This OC utility supports both 32-bit and 64-bit version of Windows 7/8/10. You can download this overclock tool from the link given below. A graphics card overclocking tool from Asus. The User Interface resemble that of MSI Afterburner and it can be used to overclock GPU, Memory and you can also control the voltage and fan speed. The fan speed can be set manually or in auto mode depending on your choice or preference. You can download this ASUS GPU Tweak overclock utility for Windows OS for free from the link given below. A feature rich and powerful graphics card overclocking tool from Palit. 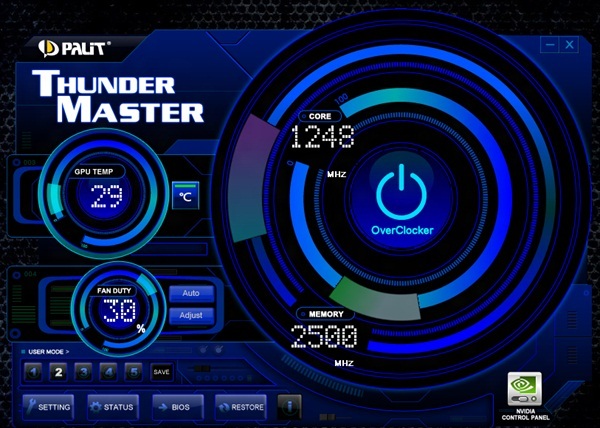 Palit ThunderMaster can be used to overclock GPU core clock, memory clock and adjust fan speed and voltage settings. It includes many more other features like graphics card info, fan speed curve, custom profiles, VBIOS loading etc. You can download this GPU overclock utility for free from the link given below. 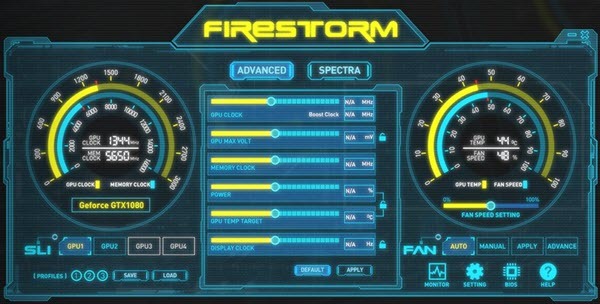 Zotac Firestorm is an advanced overclocking software for nvidia Geforce graphics cards. It now comes with new and improved user interface and features. It supports multiple Graphics cards in SLI configuration and you can overclock GPU, memory & adjust voltage and fan speed settings. The various features include custom profiles, BIOS save & Flash and hardware monitoring. It supports the latest DirectX 12 GeForce graphics cards and you can download it for free from the link given below. 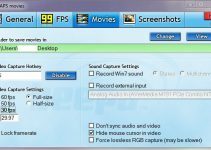 Gainward ExperTool is a simple yet feature rich graphics card overclock tool from Gainward. The various adjustments include GPU & Memory overclock and fan control. It also shows the GPU temperature and includes custom profiles option. 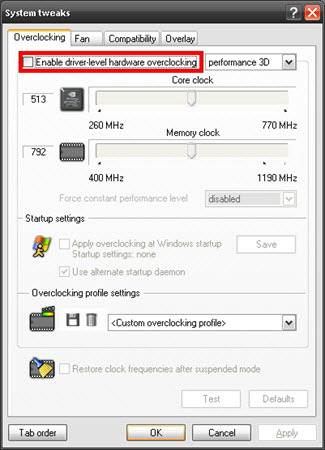 You can download this overclocking utility from Gainward from the link given below. NVIDIA Inspector is a small overclocking utility for graphics cards based on Nvidia GPU. This software also acts as graphics card info tool as it tells you all the technical details or specifications of your GPU and memory of the graphics card. Using this overclocking application you can overclock your Nvidia graphics card for achieving better performance in games and other graphics applications. 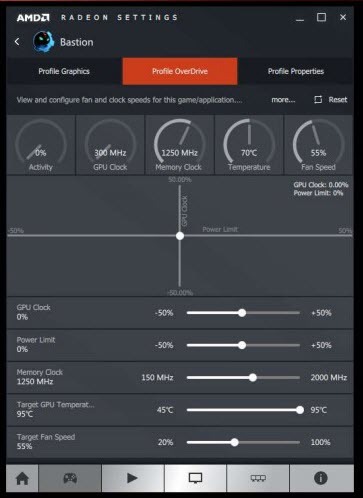 This OC tool has got a very simple interface and it also allows you to set Fan speed, change GPU voltage and set power and temperature target for a better overclock. 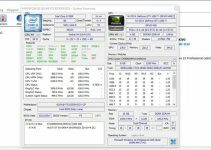 NVIDIA Inspector is also known as nvidiaProfileInspector and is a open source overclocking tool for Nvidia graphics cards. You can download NVIDIA Inspector for free from the link given below. Well at the end I would like to say that I have listed down the best graphics card overclocking softwares for both NVIDIA and AMD graphics cards. These graphics card overclocking tools supports the latest GPUs and drivers whether it is from nvidia or AMD. You can choose any of the overclocking software according to your choice and use it for overclocking graphics card. If you have any queries about graphics card overclocking or GPU overclock tools then you can ask me by leaving a comment below.